If you were led here by internet search, you probably wonder what you're reading, and longtime readers may wonder the same. A translation blog is what I call this, in the casual sense that all the verbal content is translated by me. Theory of translation concerns me intensely, but all you'll find here are unplanned results of practice. It began as a sponge of Apelles flung at an internet canvas. The impulse is easy to recollect: after half a lifetime in the San Francisco Bay Area, I had just moved away, and I imagined that blogging would help me stay in touch with friends back home. In this regard it was not a success. My community's early 2000s-era embrace of the medium had slackened, for one thing, but a bigger obstacle was my private nature. The blog carried no links to other sites, nor even my name until 2012, and I doubt the folks at home could tell I was reaching out. The content was no help, either. Having begun with translated material, I posted more, and it didn’t take long for the template to solidify, devoid of the diaristic and confessional or anything that might invite a connection to living beings. And so the blog developed into a jumble of whatever I was reading that I didn’t want to forget. and that of al-Ṣafadī to some thirty. If this blog were to have an Arabic title, it could only be al-Tadhkira. Its actual title was lifted from a bilingual religious publication one finds in certain vegetarian restaurants. 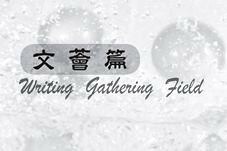 I am not qualified to parse it myself, but I am informed that "writing gathering section" is a more accurate word-for-word translation of the Chinese-language phrase appearing as a running head within the magazine. "Field" is a happy metaphor, though. It suggests growing things (an idea already present in 薈, the character for "gathering"), and the freedom to graze on them. I don’t keep a plot of land, but it’s the best metaphor I know for "room for [thinking or] dancing [or doing whatever]" (Greek chōra). All of that is what makes this my writing gathering field. The reasons for keeping a private blog are easy to understand. Why the increasing effort to give this one a public face? Mercenarism is a large part of it. Books need people to sell them, and personhood now has this necessary online component, where lacking an internet "footprint" is like failing to cast a shadow. And to be sure, this blog now serves as a publicity vehicle for the 2017 edition of Ibn Khālawayh's Names of the Lion from Wave Books, along with any other translations I manage to put out. Another reason for venturing outward candor is the amount of traffic that some posts get, enough to void the pretense of a private blog. To my seekers after news of ancient veterinary medicine, descriptions of the locust, and cat poems, I am happy to be of service, and I promise more pre-modern reports of the animal kingdom to come.